The new Detroit Public Schools Community District (DPSCD) is undergoing an unprecedented period of change and transformation that will position DPSCD as a high-quality education option of choice for families city-wide. 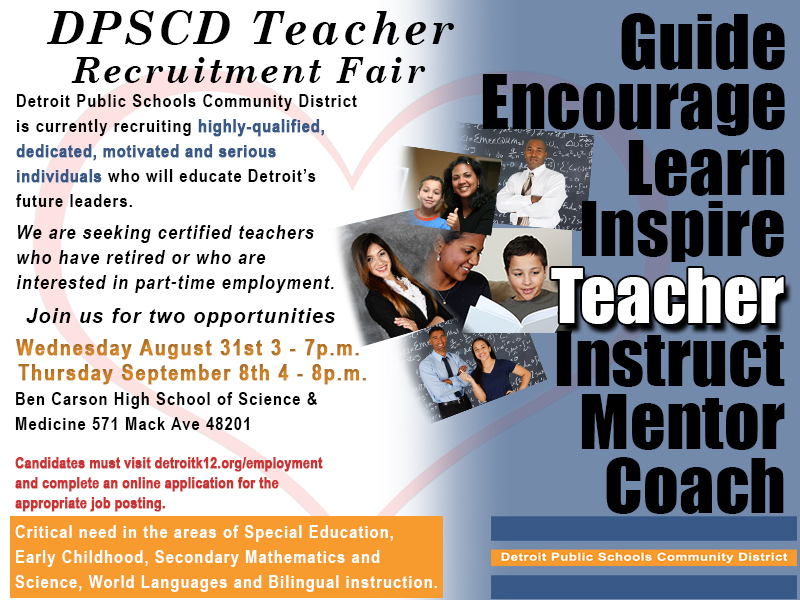 We are excited to announce that DPSCD will host a Teacher Recruitment Fair on Thursday, September 8, at Benjamin Carson High School for Science and Medicine. We are also seeking certified teachers, certified teachers who have retired and certified teachers who are interested in part-time employment opportunities. 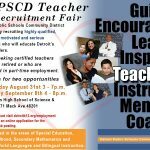 The Teacher Recruitment Fair aims to fill positions for the 2016-2017 school year. There are various opportunities for immediate placement. Interviews will be held on-site and conditional offers provided to qualified candidates. This event is for new applicants only. Teachers already employed by the district do not need to attend. Applications are being accepted for ALL teaching positions. However, there is a critical need in the areas of Special Education, Early Childhood, Secondary Mathematics and Science, World Languages and Bilingual instruction. Candidates interested in being considered for filling any teaching position must visit detroitk12.org/employment and complete an online application for the appropriate job posting for admittance to the Teacher Recruitment Fair. Please be sure to review the method of application required for the Teacher Recruitment Fair job announcement and upload your letter of interest, resume and other documents only to this job announcement. Applicants can also call 313-873-6897 for more details. Thursday, September 8, 2016 – 4:00 to 8:00 p.m. This entry was posted in Info News Center, News and Press Releases, Student Showcase and tagged DPS Community District.